When a person becomes a genuine believer in Jesus Christ he is a changed person – he has a new relationship with God, a new outlook on life, a new set of values and new motives. He has spiritual life. But he must still live in the fallen human society from which he came, and that puts him in an awkward position. He lives and works with the people he knows, but can no longer conform to their standards of behavior. Much of the second half of Paul’s Epistle to the Ephesians is taken up with this problem. “This I say, therefore, and testify in the Lord, that you should no longer walk as the rest of the Gentiles walk, in the futility of their mind. . .” (Eph. 4:17; NKJV). “Walk” is the biblical word for how one conducts his life; and according to this verse Christian believers are not to live like the rest of society around them. But why? What is wrong with getting along with everyone else? Well, first of all, look at how the text describes human society. The Gentiles walk “in the futility of their mind, . . .who being past feeling, have given themselves over to lewdness, to work all uncleanness with greediness” (vv. 17,19). On the one hand they are “past feeling” – their conscience no longer bothers them, and they have no sympathy for others. Then they have “given themselves over” to “lewdness.” They have largely abandoned themselves to their physical desires and appetites. The word translated “lewdness” implies a complete lack of restraint – it suggests licentiousness, wantonness, or excess. “Uncleanness” is a term Paul often uses to describe a variety of sexual sins, including homosexuality (cf. Rom. 1:24,26,27). And the Gentiles do this with “greediness” – their desire is never satisfied; they always want more. And while this may present a rather extreme example, it is nevertheless true that secular society is largely motivated by self-interest, and only the law and social stigma restrain people from the worst excesses. But this puts human society at odds with God’s moral standards. Paul describes those standards this way: “for the fruit of the Spirit is in all goodness, righteousness, and truth” (Eph. 5:9 – some ancient manuscripts and versions read “fruit of the light”). What God wants, what He expects of all human beings is “goodness, righteousness and truth” – we are to do what is good for others, what is right in itself, and what is honest and true. This means, positively, that we are to make it our aim in life to be “finding out what is acceptable to the Lord” (5:10) and “understand what the will of the Lord is” (5:17). The word translated “finding out” (“trying to learn” – NASV; “try to discern” – ESV) basically means to put something to the test to determine its true character. The idea here is that we apply the general principles of God’s Word to the individual circumstances of our lives in order to determine what is “acceptable” (lit., “well-pleasing”) to the Lord. Our aim in life should always be to please God in the way we live. But negatively this means that we are to “have no fellowship with the unfruitful works of darkness, but rather expose them” (5:11). There are certain things we are not to do, no matter what the rest of society thinks. These things are “the unfruitful works of darkness,” the often compulsive, anti-social and self-destructive habits and addictions that are so widely accepted today – everything from smoking cigarettes to cheating on your spouse. What it comes down to is that either we are going to do things God’s way or man’s way. “But,” some will ask, “what do we gain by doing things God’s way? Why make our lives difficult by going against the world?” If we just go by what we can see in the here-and-now, it may seem self-defeating to go against the world. We stand to lose family, friends and economic opportunities. What we must remember, however, is that there is more to life than just the here and now. “For this you know, that no fornicator, unclean person, nor covetous man, who is an idolater, has any inheritance in the kingdom of Christ and God” (5:5). The “kingdom of Christ and God” refers to a time when the Messiah will establish peace and justice throughout the earth. Only the righteous, however, will “inherit” this kingdom, i.e., enter into it and enjoy its blessings. Exactly when and how this kingdom comes into existence is a matter of intense discussion and debate. While there is one sense in which it is already present within the church (Lu. 17:20,21; Col. 1:13), when the Scripture speaks of “inheriting the kingdom” it generally refers to a future event, i.e., when Christ returns and establishes His kingdom on earth (Matt. 25:31-34). And if the kingdom is supposed to be the reign of perfect peace and righteousness, it follows from this that the unrighteous will not be allowed in. The rich and powerful may think that they can get away with a great deal now, but they will not then. In the end it is God’s will that will prevail. “Let no one deceive you with empty words, for because of these things the wrath of God comes upon the sons of disobedience. Therefore do not be partakers with them” (Eph. 5:6,7). We have already seen in our studies in Ephesians that all genuine believers are a part of the universal church, which is described as “the body of Christ.” We have also seen that we are to be “endeavoring to keep the unity of the Spirit in the bond of peace” (Eph. 4:3; NKJV). But how is this possible? Given the highly fragmented church scene today, how could we ever achieve church unity? Part of our problem is that the church today does not function the way it was intended to. Today when we see the word “church” in our Bibles we think that we know what it means. We automatically think of an organization that meets in a building and has a paid pastor brought in from the outside to run the various programs and activities of the church. Most of the church members simply show up on a Sunday morning and sit passively in their pews while the church runs through the program outlined in the bulletin. There is music, there is an offering to defray expenses, and there is a comforting message delivered by the pastor. That, however, is not how a church is supposed to function. What we have inherited from the past is an institutional model of church life that slowly evolved over the centuries. But it is very far from what is described in the New Testament. In Eph. 4:7-16 the apostle Paul gives us an overall picture of how the church is supposed to operate. The first thing that is to be noted is that the ministry involves the exercise of spiritual gifts. “But to each one of us grace was given according to the measure of Christ’s gift” (4:7). “Grace,” in this context, is the special ability to perform a spiritual ministry, and it is something that is given by Christ Himself through the Holy Spirit. It is not a diploma received from an academic institution. There are people who have never darkened the doors of a college or seminary who have the spiritual gift of teaching. Sadly, there are many who have seminary degrees who do not. Our text says that individuals have these gifts “according to the measure of Christ’s gift,” i.e., it is up to Christ to decide which Christian has which gift. Our job is to discern who has which gift, not to create a gift which has not been given. Secondly, it should be noted that every member of the church has a spiritual gift of some sort. “But to each one of us grace was given.” Thus ministry is not the exclusive prerogative of the paid professional. Rather, all the members of the church should be actively involved in ministering to each other. Some of the gifts, of course, do involve a formal teaching ministry, and Paul lists these in verse 11: “And He Himself gave some to be apostles, some prophets, some evangelists, and some pastors and teachers . . .” In this context the term “apostles” evidently refers to the twelve original apostles who functioned as the personal representatives of Christ and were the human founders of the church. There is much debate today, of course, about whether or not the gift of prophecy still exists, but there is no clear indication in the New Testament that it was meant to cease, and there have been incidents of prophecy down through history that appear authentic. “Evangelists” would probably be what we would call today missionaries – traveling preachers who would parent churches. There would have no distinction in Paul’s day between foreign and domestic missions. Anyone who was sent to preach the gospel to the lost was an evangelist. And then, of course, there were pastors and teachers, who would typically occupy the office of elder in a local assembly. But what is the aim of the teaching ministry? Paul tells us that it is “for the equipping of the saints for the work of ministry, for the edifying of the body of Christ” (v. 12). In other words, the aim here is not to concentrate ministry in the hands of a single person or a small professional staff, but rather to make it possible for everyone in the church to use their individual spiritual gifts to minister to each other. But what does this accomplish? The passage makes it clear that the ultimate aim of the ministry is spiritual unity: “that we all come to the unity of the faith” (v. 13). And how is this accomplished? By coming to “the knowledge of the Son of God, to a perfect man, to the measure of the stature of the fullness of Christ.” And this, in turn, means that “we should no longer be children, tossed to and fro and carried about with every wind of doctrine, by the treachery of men, in the cunning craftiness of deceitful plotting” (v .14). In other words, doctrine, truly sound doctrine, should unite rather than divide. And it does this by drawing us each closer to Christ, and as we each draw closer to Christ we draw closer to each other, like an ever constricting circle. Thus, “speaking the truth in love” we are to “grow up in all things into Him who is the head – Christ” (v. 15). The unity of the universal church depends on a common relationship with Christ Himself. Or, to put it another way, the Holy Spirit does not lead different parts of the body in different directions at the same time. If we are all truly following Christ then we should all be headed in the same direction. The end result should be that “the whole body, joined and knit together by what every joint supplies, according to the effective working by which every part does its share, causes growth of the body for the edifying of itself in love” (v. 16). Here it will be noted that “the whole body,” not just a privileged few, has an important role to play in building itself up in love. (To “edify” literally means “to build up”). Today most churches are filled with nominal Christians who are content simply to show up on Sunday mornings and sit there passively in the pews and be spoon-fed by the pastor. This is not what church is supposed to look like, however. It is supposed to be an active, living fellowship of brothers and sisters in the Lord who care for each other and minister to each other’s needs. It is in this practical, concrete way that the love of Christ is made manifest to the world. The past several decades have seen a large number of modern English translations of the Bible reach the market, and this, in turn, has produced a reaction in some quarters. With a bewildering array of translations from which to choose, some have clung defensively to the old King James Version of the Bible with which they have long been familiar, the version that has served as the standard English translation for centuries. A major part of the controversy surrounds the Greek text underlying the translation of the New Testament. The old King James Version was based on what is known as the “Textus Receptus,” a printed version of the Greek New Testament that goes back to the beginning of the Protestant Reformation. More recent manuscript discoveries, however, along with some debatable methodology, has led to newer editions of the Greek text which differ somewhat from the older one. This newer text underlies virtually all of the modern English versions, with the notable exception of the New King James Version. Along the way there have been a variety of critics who have challenged the newer methodology, and among them was Edward F. Hills. The first edition of his book The King James Version Defended, appeared in 1956. He subsequently revised it and a second edition appeared in 1973. Dr. Hills’ academic credentials were impressive – he had degrees from Yale, Westminster, Columbia Seminary, and Harvard. His reading was also impressive – the book’s 475 footnotes cite everything from Albert Einstein to St. Anselm to Immanuel Kant. Yet despite his massive erudition his basic argument is flawed. In this reviewer’s opinion he failed to make his point. Dr. Hills tries to argue that because the Bible is God’s inspired Word, God must have preserved it free from corruption. Dr. Hills then goes through the history of the transmission of the text, and argues that at each step along the way the providence of God was responsible for the end result. So far, so good. But does that mean that all translations should be based on the Textus Receptus? The problem is that the various versions and manuscripts available to us today differ somewhat from each other. So how, then, do we know which ones are the most accurate? Which one is the pure text that has been preserved through the centuries by divine providence? One obvious possible answer would be what is variously known as the “Byzantine,” “Koine,” or “Majority” text (Dr. Hills prefers to call it the “Traditional” Text). This was the standard text of the Greek Orthodox Church and is preserved in the large majority of surviving manuscripts. But the Textus Receptus is not identical with the Byzantine Text –it differs from it at a number of points. Dr. Hills, then, tries to argue that Erasmus, the original editor of what became the Textus Receptus, “providentially” corrected the Byzantine Text using reading from the Latin Vulgate, which, according to him, providentially had become the standard Bible of the Western, Roman Catholic Church. But if the Byzantine Text and the Latin Vulgate were both providentially preserved by God, why do they differ at points from each other? And why would Erasmus have had to correct the Greek text using the Latin? It undermines Dr. Hills’ whole argument that divine providence has preserved the text of the New Testament pure and inerrant. And could it not be further argued that in the providence of God Westcott and Hort were raised up in the 19th Century to further purify and refine the text? How then can we conclude that the Textus Receptus only is God’s pure Word? Yes, we believe, in the words of the Westminster Confession of Faith, that the Old and New Testaments, “being immediately inspired by God, and, by His singular care and providence, kept pure in all ages, are therefore authentical . . .” (WCF, I. viii). That does not negate the fact, however, that the surviving manuscripts contain variant readings, and that the modern scholar must reconstruct the original text using the manuscript evidence available to him. I think, that on the whole, we should accept the Byzantine Text as the one that God in His providence has preserved for our use – see our earlier blog post on “New Testament Textual Criticism” (April 13, 2016). Does this mean that the Byzantine Text is absolutely inerrant in every detail? Not at all; neither is any translation into English perfect either. But in God’s providence the Byzantine Text is the one that God wanted us to have, and there is every reason to believe that it accurately reflects the original text of the Greek New Testament. No cardinal doctrine of the faith hinges on such minor textual questions as whether Eph. 5:9 reads “the fruit of the Spirit” (Byzantine Text) or “fruit of the light” (Alexandrian Text, Latin Vulgate). It is the thoughts, concepts and ideas that were communicated by the Holy Spirit to the inspired prophets and apostles, and these concepts and ideas have been preserved in the text that has come down to us. The average reader of the Bible can know God’s will for his life by reading any reasonably accurate English translation of the Bible out on the market today. That is the way in which God’s Word had been providentially preserved for us. So what do we make, then, of the venerable old King James Version of the Bible? In some ways it is an unparalleled literary masterpiece. For example, in Exodus 32, as Moses and Joshua are descending from Mount Sinai and hear the commotion below, Moses exclaims, “It is not the voice of them that shout for mastery, neither is it the voice of them that cry for being overcome: but the voice of them that sing do I hear” (v. 18) – exactly what you would expect Moses to have said if English had been his first language! Yet in other places the language is hopelessly archaic and poses a real barrier to understanding for the modern reader. This is especially true in places where words have changed their meaning over time. For example in Psalm 5:6 we read in the King James Version: “Thou shalt destroy them that speak leasing . . .” The judgment of God on landlords and car dealers? No. Here the word “leasing” is used in its archaic sense of “the act of lying.” The New King James Version renders it “You shall destroy those who speak falsehood. . .” Dr. Hills himself lists 17 words and phrases in the old King James that are obsolete (p. 212). Our aim in Bible translation should be the same as that of John Wycliffe, Martin Luther and William Tyndale – to make the Word of God accessible to the common people in language that they can understand. Modern English translations of the Bible should not be shunned. The Bible is a very old book – its last books were written 2,000 years ago, long before the invention of printing. For centuries it was copied by hand, and the original manuscripts have long since disappeared. But if we no longer have the original manuscripts, how do we know what they said? How can we tell how accurate the Bibles we have today are? The art of reconstructing the original text is known as “textual criticism,” and it can be both complicated and controversial. During the long centuries that the biblical manuscripts were copied by hand, variations would appear in the text. These are called “variant readings.” The trick is to determine which of the variant readings represent the original text. In the Old Testament this has not been a large problem. There is a standard Hebrew text, called the “Masoretic Text,” which has been faithfully preserved for centuries. It forms the basis for most modern translations of the Old Testament. Determining the text of the New Testament, however, is a little more complicated and difficult. The first published, printed edition of the Greek New Testament appeared in 1516. It was the work of the famous Dutch humanist Desiderius Erasmus. It was based on a relatively small number of manuscripts, some of which were in the monastic library at Basel, Switzerland. Erasmus’ text underwent several subsequent revisions. Eventually it became known as the “Textus Receptus” (the “received text”) and was the basis for the King James translation of the Bible in 1611. The Textus Receptus roughly conforms to, but does not exactly represent, the standard text found in the majority of Greek manuscripts. This is sometimes called the “Byzantine,” “Koine,” or “Majority” text (or “das Reichstextum,” if you are a real German!) In 1881 however, two British scholars, B.F. Westcott and F.J.A. Hort, published their edition of the Greek New Testament. The Westcott and Hort edition marked a significant departure from venerated Textus Receptus. Westcott and Hort argued that not all manuscripts should be accorded equal weight. Rather, the weight attached to any individual manuscript should be based on its origin and its relationship to other groups of manuscripts. The basic principle is, in itself, sound enough. The problem is with the way that Westcott and Hort applied it. They tried to group together manuscripts and trace their genealogy, but in doing so they relied much too heavily on pure speculation. Wescott and Hort rejected the Byzantine Text outright as representing a late revision of the original text. 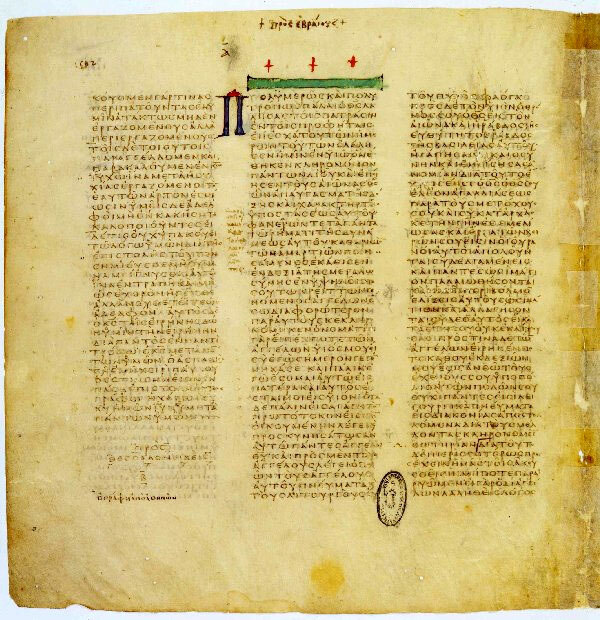 Instead they concluded that two earlier manuscripts bring us closer to the original: Codex Vaticanus (designated by the letter “B”) and Codex Sinaiticus (designated by the Hebrew letter aleph). The Westcott and Hort text was used as the basis for the Revised Version of 1881 and the American Standard Version of 1901. And Westcott and Hort’s methods have been used since then in more recent editions of the Greek New Testament, including those by Eberhard Nestle and the United Bible Societies. These editions, in turn, have formed the basis for most modern translations of the New Testament. Most modern textual critics try to group the surviving manuscripts into “families.” The Byzantine Text represents one such family. Most of the older manuscripts presumably fall into the Alexandrian, Caesarean and Western families. The Alexandrian text is fairly well defined and documented. It is represented by the two manuscripts mentioned earlier (Codex Vaticanus and Codex Sinaiticus) as well as a fairly large number of very old papyrus manuscripts found in Egypt. The other two “families,” however, are highly problematic. The evidence for their existence is highly conjectural. There are few, if any, manuscripts that perfectly represent either of them. The textual critics then look at these various older manuscripts and try to piece together what they think the original text looked like. This, too, is highly conjectural. For example, one commonly used rule of the thumb is that “the more difficult reading is to be preferred.” The assumption here is that a later copyist is more likely to alter a reading if he thought that the reading did not make much sense. Therefore, the reasoning goes, the reading that doesn’t make much sense must have been the original one. But there are two underlying assumptions here: 1) the original text was rife with errors, and 2) later copyists felt free to make changes to the text. Neither assumption is likely to be true. I would suggest that a more sensible approach would be to go by what we actually know about individual manuscripts and versions, and weigh them accordingly. So, to begin with, what do we know about the Byzantine Text? We know that it was the text used by St. John Chrysostom, who was the bishop of Constantinople from A.D. 398 to 403. But where did Chrysostom get it? Most modern textual critics assume that he brought it with him from Antioch, and that it can be trace back to a revision by Lucian of that city. But I would contend that a more likely explanation is at hand. We know that around A.D. 331, when the Emperor Constantine was building two new churches in his new capital city of Constantinople, he asked one of the greatest biblical scholars of his day, Eusebius of Caesarea, to prepare for him fifty copies of the Greek Bible. Eusebius had access to the library of one of his predecessors, Pamphilius of Caesarea, who lived during the later years of the Third Century. Pamphilius’ library had one of the best collections of Bibles available at the time. We also have some interesting information about Codex Vaticanus. As mentioned above, it bears a close resemblance to a number of older papyrus manuscripts found in Egypt. This suggests that it is a very good representative of the “Alexandrian” or “Egyptian” type of text. But how did it manage to get into the Vatican Library in Rome? Here again there is an interesting circumstance. The books of the New Testament are arranged in the manuscript in the same order as suggested by St. Athanasius, and we know that Athanasius spend some time in exile in Rome in A.D. 340. Since that is about how old most scholars think that the manuscript is, it is tempting to think that Athanasius himself may have presented the manuscript to the Emperor Constans. The Latin Vulgate, we know, was produced by St. Jerome between A.D. 382 and 388, and it became the standard Latin version of the Bible. Codex Bezae, on the other hand (designated by the letter “D,” and cited by modern scholars as one of the chief witnesses for the “Western” text) contains many idiosyncratic readings, and may have originated in southern France, an area where the Albigensian heresy was rife. It can hardly be considered a reliable witness to the original text. Our conclusion, then, is this: the Byzantine Text, should be given the benefit of the doubt wherever possible. Readings from Codex Vaticanus and the Latin Vulgate should be given serious consideration. Most of the other “findings” of modern textual criticism should be taken with a grain of salt. The problem with most modern textual criticism is that the critics are in the position of second guessing the work of such ancient church fathers as Eusebius, Athanasius and Jerome. But the church fathers were competent scholars and had access to better manuscripts than are available today. Shouldn’t their work be given preference? We are currently witnessing a presidential campaign unlike any that we have seen in a very long time. Angry, frustrated voters have turned their backs on traditional politicians, the governors and senators that traditionally run for president, and have embraced instead outsider candidates, some with no prior government experience at all. Even the two U.S. senators still in the race, Bernie Sanders and Ted Cruz, are both viewed as outsiders. And at the center of it all is the brash and flamboyant Donald Trump. But who exactly is “the Donald”? What is he really like? What kind of president would he make? We get some picture of the man in his best-selling book, Trump: The Art of the Deal (Ballantine, 2015). Here we catch a glimpse of how he became such a successful businessman. He possesses a rare combination of traits and qualities that destined him for success. He has plenty of drive and ambition, a shrewd understanding of human psychology, a firm grasp of economic reality, and the uncanny ability to recognize a good opportunity when he sees one. He is also very good at managing the building projects he undertakes. He chooses contractors carefully, and works with them closely to make sure that the projects stay on schedule and under budget. But part of his success as a businessman also stems from the fact that he can be a manipulator. As he himself explains it in The Art of the Deal, you need to use your leverage in order to make a deal, and “leverage often requires imagination,” as he delicately put it. He cites as an example the attempt he made to get Holiday Inns to go into partnership with him on an Atlantic City casino. “They were attracted to my site because they believed my construction was farther along than that of any other potential partner. In reality, I wasn’t that far along, but I did everything I could, short of going to work at the site myself, to assure them that my casino was practically finished” (pp. 53,54). As Trump summarized his method, “I’m the first to admit that I am very competitive and that I’ll do nearly anything within legal bounds to win” (Ibid., p. 108). He is also supremely egotistical. After all, most of The Art of the Deal is about himself and his successful career. And in his book Crippled America: How to Make America Great Again (Threshold Editions, 2015), in which he outlines his campaign themes, his main argument is that he is a smart, successful businessman who knows how to get things done, while conventional politicians, he would have us to believer, are all stupid and incompetent. Trump can also be vindictive as well. He puts it this way: “In most cases I’m easy to get along with. I’m very good to people who are good to me. But when people treat me badly or unfairly or try to take advantage of me, my general attitude, all my life, has been to fight back very hard” (The Art of the Deal, pp. 58,59). At one point he gave a woman a good job in his organization. But later, when he needed her help and she refused, he never forgave her. “This woman was very disloyal, and now I go out of my way to make her life miserable” (quoted in George Beahm, Trump Talk, Adams Media, 2016, p.121). So what would Donald Trump do if he were to become President? In Crippled America he lays out a litany of complaints – uncontrolled immigration, ineffective foreign policy, a failed school system, a sick economy, and a crumbling infrastructure – but he is a little vague when it comes to solutions. He wants to build a strong national defense and repair a crumbling infrastructure. He does not want to touch Social Security or Medicare benefits. He wants to reform the tax code by closing loopholes and lowering marginal rates. He says this would be revenue neutral. But how, then, would this close the huge budget deficit gap? He claims that he can reduce the national debt by eliminating waste, fraud and abuse, and by promoting economic growth. But politicians have been promising this for generations – and the national debt keeps on ballooning. Trump is basically asking the voters to trust him because he knows how to get things done. And the social issues he has a mixed record. He acknowledges his indebtedness to a former pastor, Norman Vincent Peale, the famous author of The Power of Positive Thinking. But he has made his fortune in the casino industry, has been married three times and divorced twice, and always insists on having a prenuptial agreement before getting married. He was once quoted as saying, “But there comes a time when you have to say, ‘Darling, I think you’re magnificent, and I care for you deeply, but if things don’t work out, this is what you’re going to get’” (Trump Talk, p. 148). On abortion he says that he is pro-life, but he hasn’t always felt that way. He says that one of the things that changed his mind was when the wife of one of his friends became pregnant. At first the friend did not want her to go through with the pregnancy, but changed his mind after the baby was born. It changed Trump’s mind on abortion as well. “And you know here’s a baby that wasn’t going to be let into life. And I heard this, and some other stories, and I’m pro-life . . .” (Trump Talk, p. 48). Donald Trump has the potential to be a truly effective, perhaps even great, U.S. President. If he surrounds himself with good advisors, if he uses his negotiating skills effectively, he could become a forceful leader who will leave his mark on history. But he could just as easily turn out to be a disaster, or even worse, an outright dictator if things don’t turn out his way. The way he is running his campaign is pure demagoguery, and it bodes ill for the future of the Republican Party and of American democracy.